A common snack / starter in almost all Bengali households. 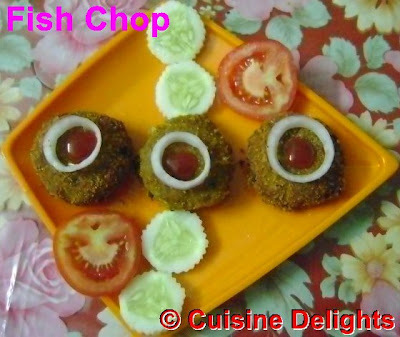 The most recent occasion when I made these delicious & easy-to-make fish chop during my hubby's birthday. 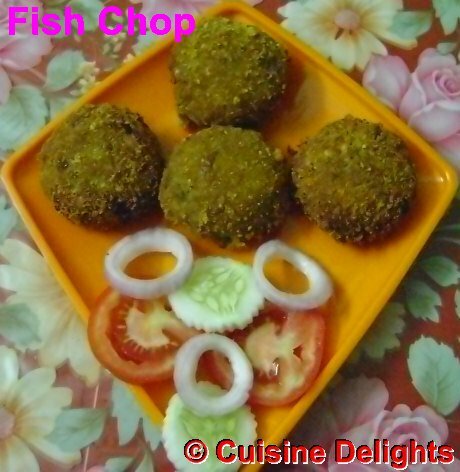 The typical Fish Croquette or Maachher Chop is a mashed and spiced fish fillet in an envelope of mashed potato, rolled into a sphere/oval shaped, coated with bread crumbs and deepfried. Wash the fish pieces. Marinate the fish pieces with Lime juice, a pinch of salt and turmeric for 5 minutes. Steam the marinated fish for 8-10 minutes. Let it cool. Mash the steamed fish and carefully remove the bones. Mash it to a smooth paste. Mix the mashed fish with mashed potatoes, add the desired salt. In a wok, heat some oil. Throw in the bay leaf and whole garam masala. As it splutters, add the finely chopped onions and little sugar for taste & caramelisation. Fry the onions till brown, but not burnt. Add the turmeric, cumin powder, red chilli powder and cook the masala well to eliminate the raw smell. Add the mix of mashed potatoes and mashed fish. Stir well and mix it well with the onion-masala paste. The mixing should be uniform and the raw taste of potato & fish should be totally eliminated. It takes around 12-15 minutes. Keep stirring to ensure the mashed mix does not burn! Sprinkle garam masala powder just before taking the mashed mix off the flame. And again mix well. The fish chop filling is ready for the shaping, moulding and coating to begin. Let it cool. Roll them into circular tablets or any shape you desire! The outer surface should be smooth. In a flat bottomed bowl, mix the cornflour with water to make a paste of thin consistency. In a flat plate, take the bread crumbor crushed cornflakes and make an even layer. 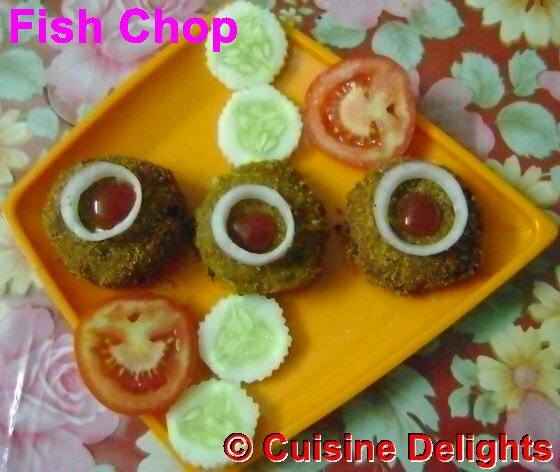 Take each shaped fish chop, dip it into the cornflour thin batter, immediately followed by rolling in the bread crumb to form an uniform coating. Repeat for all the chops. In a deep flat bottomed frying pan, take the oil, heat it and fry the chops. Take out the fried chops and place them on a kitchen tissue to soak off the excess oil.